Five of the "Pine Tree Six" stand with the iconic tree back in 1990. The white pine was brought down today after 168 years. From left to right: Autumn Wilbur, Gabe Casey, Jamie Parker, Nicole Mozden, Amy G. and Eric C.
Sections of trunk were removed with a crane Tuesday morning. [Update - June 21 - 12:59 PM] - Pieces of the pine tree will be available on a first come, first serve basis. Those interested in acquiring some pine wood should contact Phil Hutchins at the town garage at 778-2191. FARMINGTON - A town giant was brought down today after standing on Broadway for roughly 168 years. The old white pine tree, next door to Outskirts Vintage Clothing store, was reported unsafe at a selectboard meeting back in May. Board members unanimously voted to take precautionary measures and have the tree removed before anyone, or anything, got hurt. The report indicated that the tree was likely struck by lightning years ago, leaving a long, jagged exit wound. That internal damage was not fully contained by solid wood, an arborist reported, resulting in decay in the trunk. 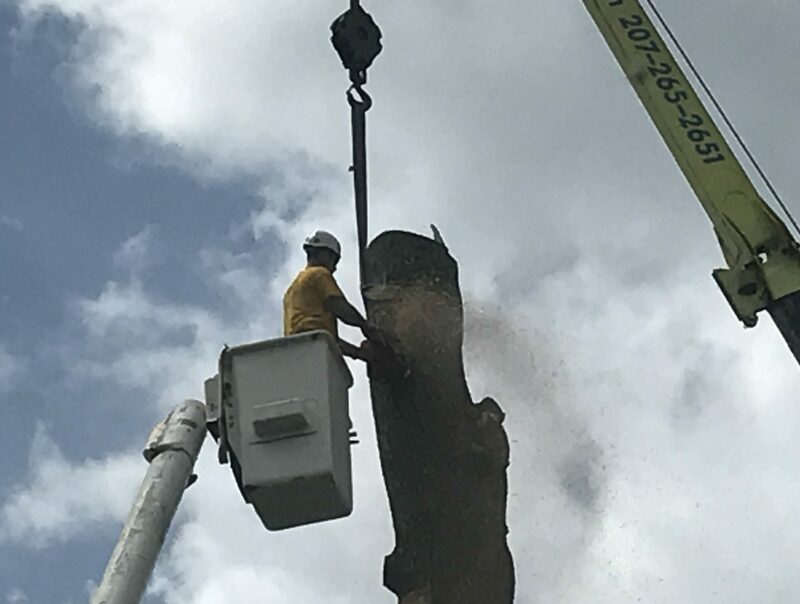 As the tree's canopy was above the weakened, hollowing section, the report concluded, the tree was at risk of simply snapping in half in a windstorm. That report was proved out as Deep Root Tree Service began lopping off sections of trunk Tuesday morning. As a small crowd gathered on closed-off Boardway, taking pictures and chatting, sections of wood were hauled down with a crane. Each section contained a core of rotting wood. 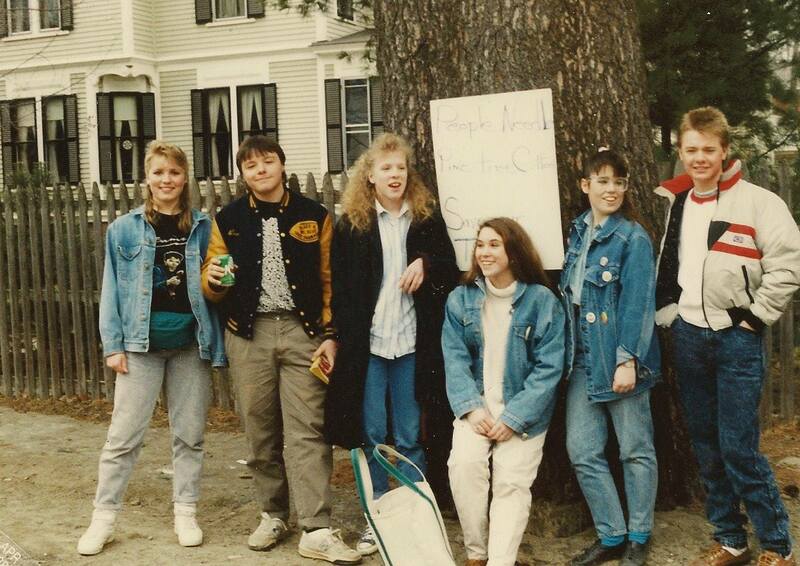 The tree was first slated for destruction in 1990, as part of a sidewalk project, but was spared thanks to the actions of the "Pine Tree Six;" local middle school students that famously stood in a circle around the trunk. 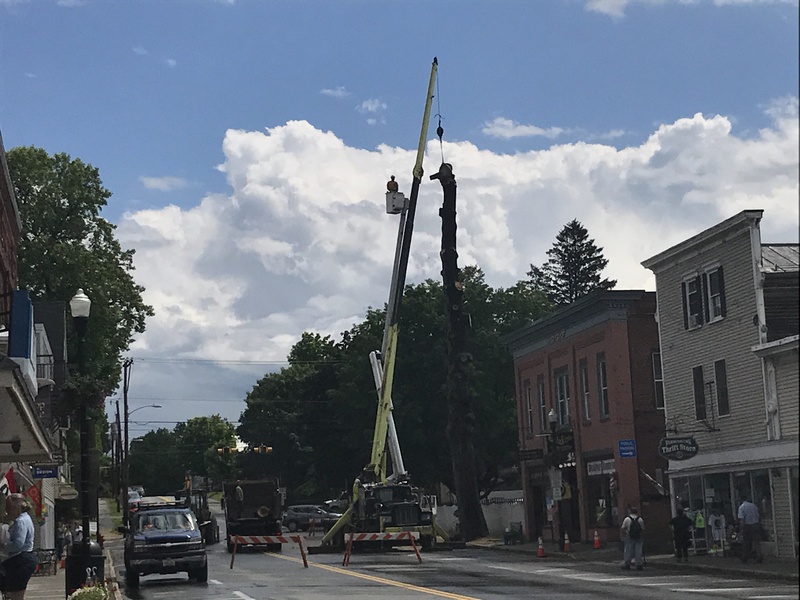 Broadway was closed for the majority of the day as a crew worked on cutting down Farmington's giant pine tree. "This act of civil disobedience by Nicole Mozden Dungee and her five classmates remains one of her class' signature activities and still is one of the most well known student actions in Farmington history. By the time it was all over, the six middle schoolers had offers from as far away as Texas and Israel to help; had brought about a half dozen special meetings of the Farmington Historical Society, the Farmington Planning Board, the Farmington Board of Selectmen and the Farmington Revitalization Committee. All involved, parents too, learned about the power of democratic action and the importance of civic involvement," A parent of one of the six commented after the peaceful protest. Each of the six students received lifetime memberships to the Farmington Historical Society, and were provided staff supervision and lunch by former Mt. Blue Middle School principal Ronald Sills. Despite breaking the rule of remaining on school property, the educational impact of the incident was recognized by MBMS staff. "The students were all freshmen, and participants in a class entitled “Sociology," conducted as a simulated town (Sunshine)," Sills said. "They learned by experience, how to conduct themselves in a democratic society, and how to properly express satisfaction or protest with civility. It occurred to me immediately, that these students were putting into practice exactly what they were learning in class." Sills described the event as a difficult one, torn between wanting to support the unexpected educational opportunity for "the six," and needing to keep the bar of school safety high. "In my time as a school principal, I always reminded myself that I felt we were in the people business, and while consistency in rule enforcement was really important, in the people business, exceptions had to be expected," he said. In the end the six were delivered a week of detention, not the normal consequence of immediate suspension. In the days following the event, the school received letters from all over the country, thanking the students for their efforts. Some even included small donations of money towards the life of the tree. The stump will be ground down by a volunteer, free of charge, and the tree will be replaced with a disease-resistant Elm tree. would be kind of neat for local artists to create things out of the wood and have them on display around town. any plans like this? Very sad good memories of youth around that tree. I spent the day watching them take down the tree. At the end, I watched a lady counting the growth rings on the stump and the unofficial total is 177 years. That puts it in place in 1840. This tree has stood and witnessed many generations. Rest in peace. How would it "feel" if the tree had crashed down and hurt someone? I read all the romantic blither blather about the protest and just roll my eyes at the silliness. The old tree HAS BEEN a safety hazard for years. Thankfully it is down now as it should have been. Recall it well.Thursday morning March 30, 1989 was the actual date. Many local business and professional leaders rallied to their defense. 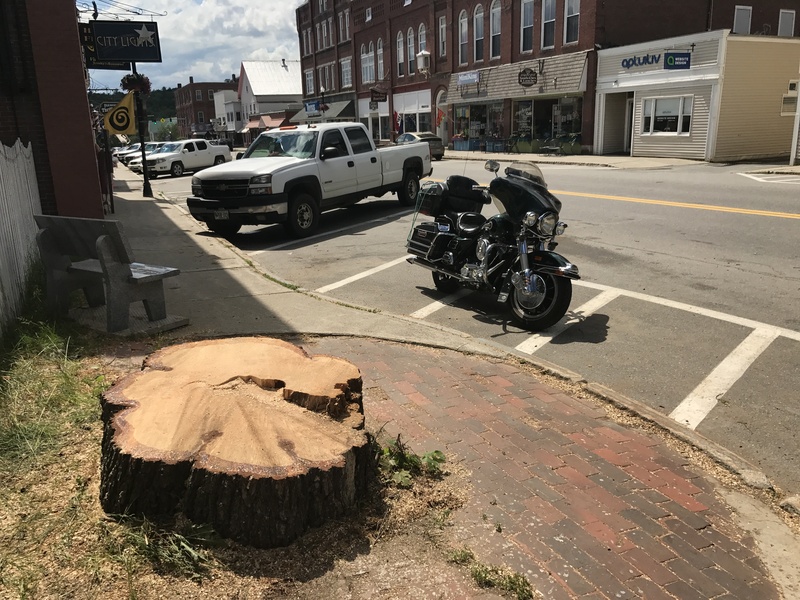 Also helpful was a member of the Board of Selectmen, Peter Tracy, then as now a professional forester, who rendered an opinion that the tree was at least at that time too healthy to be taken down and had a generation left before its demise. He was right. It would be interesting to see old photographs of the area , with the tree also in the picture . Steven, there are early Farmington photos at the Penobscot Marine Museum site that show the tree on Broadway. People interested in acquiring some pine wood should contact Phil Hutchins at the town garage at 778-2191. I'm one of the six! There has to be a way to save a piece for each of us, even though we may be scattered around the country. Amy call Phil and see if you can cut a piece. Would there be any way to plant another tree in its spot for the future generations? "Romantic...but" brought up an excellent point abut the tree being a danger for several years. Hilarious way of wording it too. Did anyone find a way to propagate this tree and replant? Currently, the plan is to plant an elm tree. If anyone would be so kind, I would love to gift a piece of that tree to my husband, as we remember fondly when our little middle school rebels saved it. We're in town in July but don't expect that a piece could be held that long. Thank you to anyone who can do me this favor! My father, Lee Gray shared stories of riding his pony (Tommy) from his home in New Vineyard to Farmington, when just a young boy. He would ride to the State Theater, tie Tommy to the tree, and then attend a movie with friends. When my father was too old to ride, the pony became the property of Elaine Adams Wells. I would have loved to have seen the tree base kept in place and carved. Perhaps including a profile of the pony. I am sorry that I did not think about it sooner. Who will rake all the mess an Elm tree leaves? Ask a forester to suggest another PINE. This one stood for177 years. I recall a friend would ride his horse from New Vineyard on a Sat. to go to the movies and tie his animal to the pine tree. Memories. ROMANTIC - YOU'RE A SCROOGE. Did the town (historical society) get a section from the base? It would be great for a tree timeline specific to Farmington! Oh, please tell me they did! Wouldn't that be a fun way for people to learn the history of Farmington? Come on all you tree huggers it was just a tree that was going to eventually come down in pieces and possible kill someone. There is nothing "democratic" about what amounts to a tantrum. Kids basicly do the old "I'm going to hold my breath" routine and get praise for doing so. It's a wonderful thing for young people to learn to be passionate about something and stand up for it and participate in Peaceful Protest. Those who never do so end up being "Hrtlss"